I meet too may business owners who still have an employee mentality. For some its because they were employees before starting their own businesses and can’t change the habit and for others they fall into it and then can’t get out of it. Its time to remind yourself of why you started your business. Because you didn’t just want a job! Too many business owners undervalue their worth and do what they have employees for. So try this exercise below. 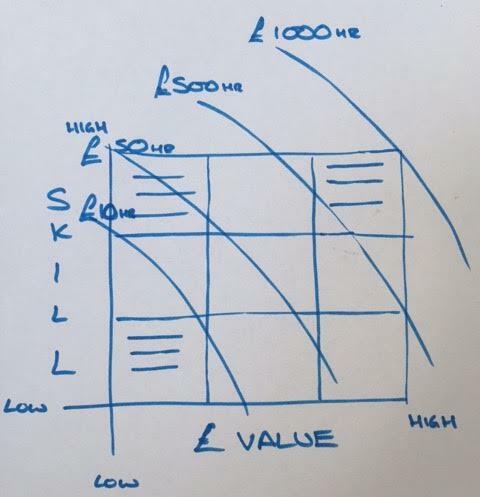 Write out all the things you do but put them in boxes of skill level high to low and value to the business high to low. 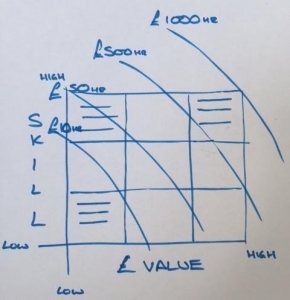 I increasingly find there are business owners who can earn the business £1000’s an hour when they are out meeting customers or strategically working on the business but can’t spend the time because they are doing administrative tasks that they could outsource for £10 an hour or give to the team. How crazy is that!? Sometimes we need to stop and look where we add value and what we need to do more of and what we need to stop altogether to ensure we are in that space. Stop feeling guilty about leaving your team to it while you grow the business, after all that’s why you built a team around you, right? Its time to fall back in love with your business and start thinking like a business owner focused on adding value and not being drawn into the business for the sake of saving a wage.